Today, finding love is more convenient. Instead of going to a bar or a blind date set up by friends, we can swipe left or right on a multitude of dating apps from the comfort of our own couch. But is meeting over social media better than meeting in real life? Do we get to know people we may have otherwise written off? Or do we lose all romance being stuck behind a screen? John Bargh, author of BEFORE YOU KNOW IT, shares his answers to these questions. Over social media we can develop relationships with people we might not have given a moment’s notice to in real life. 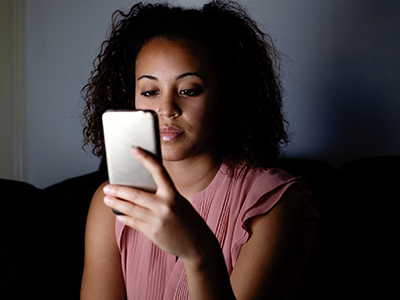 Over social media, those people can get by the “gating features,” as we called them, such as attraction or the chronic features of their face, that we use to screen people in real-life, face-to-face encounters. These initial filters allow certain people past the gates but they block many others. Many potentially great romantic relationships don’t get off the ground because of the importance we place on those gating features, mainly a person’s physical attractiveness or general appearance. We should all keep in mind Nietzsche’s advice to marry someone you can have conversations with, for most of your life together will be after the blush is off the rose. Don’t get me wrong: attractiveness is important. It is a real feature of the person. As we’ve seen, attractive faces are a literal pleasure to look at; our brain’s reward centers become active when we look at them. And, as we’ve seen, even babies prefer to look at attractive faces! It is just human nature to prefer attractive to unattractive people when it comes to close relationships. The problem comes when we use that attractiveness to make inaccurate assumptions about other qualities of the person. We tend to believe that what is beautiful is good and assume other good things, such as pleasant personality, competence, trustworthiness, when we see an attractive face. We have way too much confidence in these gut reactions based just on appearances. So that gives us [a rule]: It is perfectly fine for attraction be one part of the romantic equation, but not so fine to let it be the only, or even the main, thing. Not in the long run, anyway. Our gut reactions served us well for many thousands, perhaps millions of years. If they had been misleading or counterproductive they would have been weeded out by natural selection. But our modern life is very different from what life was like over those thousands and millions of years. People of different races, who are different from our family and neighbors, are no longer enemies who can’t be trusted. Modern technologies such as photographs of faces can fool our gut appraisal mechanisms that were developed instead for observing people in action, in the context of how they treat us and the others around us. Our gut reactions can be quite sophisticated at combining lots of information, and should be taken seriously, but here too we need to adjust for the conditions of modern life and make use of reliable data, if we have it, and the powerful ways of analyzing it now available, especially for important choices and decisions. Today even experts disagree on whether intuitions are accurate, and whether we can trust our gut. Those who say we can’t tend to study complex financial and business decisions, made with little or no time pressure, and based on reliable data, with powerful computers and software to analyze it. Those who say we can trust our instincts tend to be psychologists or evolutionary scientists, who study the mundane realities of daily life, where often we are under time pressure to make decisions and lack any relevant quantitative measures. So then, certainly, listen to what your gut, or heart, or other internal organ (including your brain) is telling you, take it seriously and don’t dismiss it out of hand, but also check your work, and always remember to give the other person a chance. Need more relationship advice? Here are the top dating dos and don’ts. Excerpted from Before You Know It by John Bargh. Copyright © 2017 by Simon & Schuster. Used by permission of the publisher. All rights reserved. Financial Times: One of the Best Books of 2017 Business Insider: One of the Best Science Books of 2017 Dr. John Bargh, the world’s leading expert on the unconscious mind, presents a groundbreaking book, twenty years in the making, which gives us an entirely new understanding of the hidden mental processes that secretly govern every aspect of our behavior.For more than three decades, Dr. John Bargh has been responsible for the revolutionary research into the unconscious mind, research that informed bestsellers like Blink and Thinking Fast and Slow. 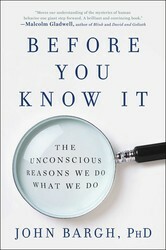 Now, in what Dr. John Gottman said “will be the most important and exciting book in psychology that has been written in the past twenty years,” Dr. Bargh takes us on an entertaining and enlightening tour of the forces that affect everyday behavior while transforming our understanding of ourselves in profound ways. Telling personal anecdotes with infectious enthusiasm and disclosing startling and delightful discoveries, Dr. Bargh takes the reader into his labs at New York University and Yale where he and his colleagues have discovered how the unconscious guides our behavior, goals, and motivations in areas like race relations, parenting, business, consumer behavior, and addiction. He reveals what science now knows about the pervasive influence of the unconscious mind in who we choose to date or vote for, what we buy, where we live, how we perform on tests and in job interviews, and much more. Because the unconscious works in ways we are completely unaware of, Before You Know It is full of surprising and entertaining revelations as well as tricks to help you remember to-do items, shop smarter, and sleep better. Destined to be a bestseller, Before You Know It is an intimate introduction to a fabulous world only recently discovered, the world that exists below the surface of your awareness and yet is the key to knowing yourself and unlocking new ways of thinking, feeling, and behaving. Share Is Meeting Over Social Media Better Than Meeting in Real Life?